Tucson International Airport celebrated its 90th year of commercial airline service in Southern Arizona on Tuesday with a reception honoring American Airlines, its longest-serving major carrier. November 28, 1927 marked the first day passengers could take to the skies on a commercial airline service in Tucson, thanks to the arrival of a six-passenger Fokker Universal plane operated by Standard Air Lines. These flights operated out of the old Tucson Municipal Airport site, which is now occupied by Davis-Monthan Air Force Base. According to the Tucson Airport Authority, American Airlines took over Standard’s route between Tucson and Los Angeles in 1929. This service included a stop in Phoenix, and headed west on Mondays, Wednesdays and Fridays and returned to Tucson on Tuesdays, Thursdays and Saturdays. The fare for this flight in 1927 was $60, which is more than $850 in today’s dollars. Airline passenger traffic grew by 300 percent after the airline matched the train fare, and by 1929, the route had expanded eastward to Douglas and El Paso. Soon, passengers were traveling on daily flights with a round-trip fare of $52.65. The airport hosted combined civil and military aircraft operations for years, and was even used as a training site for U.S. pilots during World War II. 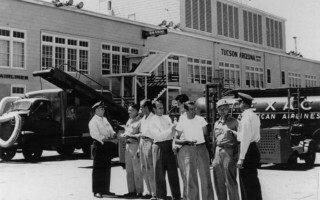 The airport moved to its current location in 1948 following the formation of the Tucson Airport Authority, and it was renamed Tucson International Airport in 1963 after its first flights to Mexico two years earlier. This was the official start to Tucson’s “jet age” as a new terminal opened to serve a growing number of passengers, as the airport boasted six airlines with 32 daily departures to 11 nonstop destinations. 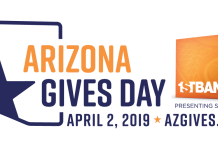 Air travel in Tucson has many memorable moments, including the September 1927 visit from famed aviator Charles Lindbergh to dedicate the airport, and the arrival of the Douglas DC-3–“America’s Largest Land Plane,”– in 1936. American Airlines got its first competition in Tucson with the arrival of Frontier Airlines in 1950. TWA came along in 1956 followed by the 1961 additions of Continental and Aeronaves de México. Tempe-based America West Airlines commenced service to Tucson in 1984, while Southwest Airlines came along ten years later. American became TIA’s largest carrier in terms of passengers served in 2015, after its merger with Phoenix-based US Airways. In February of next year, American will begin service to Charlotte, North Carolina. 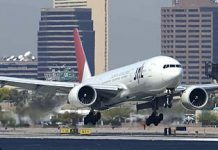 This addition means the airline will connect Tucson to five of its hubs- Charlotte, Chicago O’Hare, Dallas-Fort Worth, Los Angeles and Phoenix. Learn more on the official website of Tucson International Airport. Next articleStunning Resort-Style Estate in Chandler!